Handmade table in pippy (cats paw) oak, reclaimed oak base. Hi All, welcome to my handmade table with pippy oak top and reclaimed oak base. The trestle style dining table base took quite an effort for my humble bandsaw to slice through, but hey, we needed a new blade anyway. The dining table base slabs are 100mm thick and held together by 2 top rails and 1 centre stretcher with knock through wedges. I’ve attached some images of the dining table base, along with the rough pippy oak timber I’m going to use for the handmade table top. The handmade table top is going to be jointed using the ‘loose tongue’ technique described in my earlier blogs. The table top ends are going to be cleated or what is also known as ‘breadboard end’. This is basically a mortise and tenon joint. Usually only the central section is glued, with the whole piece being held together mechanically with the use of screws in slotted holes to allow for seasonal movement. More discussion on this subject at a later date. I’m also very happy to receive comments on all kinds of jointing techniques from any one out there. I’ll get some more pictures up once the bespoke table is together. Let me know what you think. Handmade table commission has just been started. This made to order table wil be of a trestle style and designed by the client with a little advice from yours truly. Managed to source some wonderfull ‘pippy’ oak (or what our friends across the pond call ‘cats paw’ oak) for the bespoke table top. Plus some full character oak for the handmade table base. 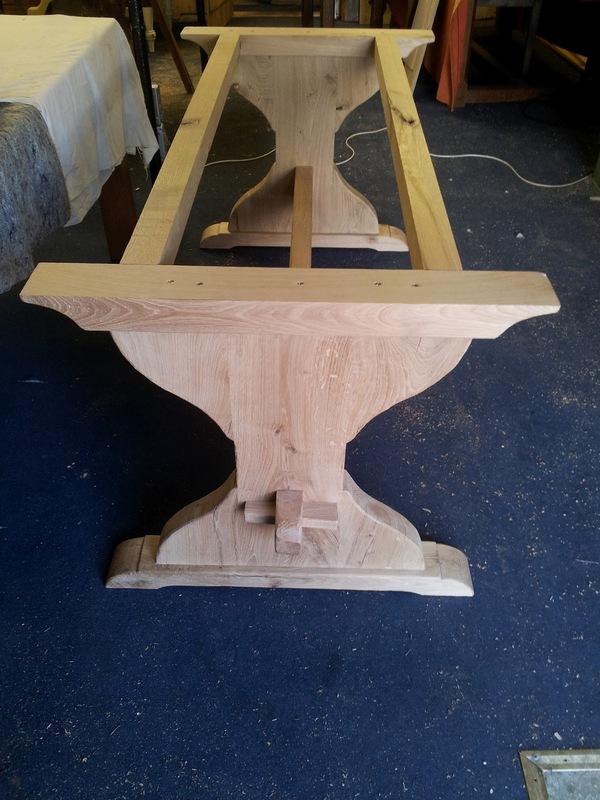 I’ll get some photo’s out as soon as l can on the handmade dining table’s progress. So the 1.8m square handmade dining table top is finally up! In consultation with the client we decided not to have my usual biscuit and peg jointing technique. As the top is made up of 8 quality oak boards, the amount of handmade wooden pegs/dowels needed to joint the top together would have been more like ‘join up the dots’ rather than ‘hey, what a fantastic grained oak top’. So we’ve employed the ‘loose tongue’ technique (there’s a joke in there somewhere) and it’s worked bang on, belted & braced underneath for generations of use. Check out the picture. The base is coming next……………..
Glad you liked the new website – Gold Stars go to Neven and everyone who helped with comments, thank you. I’ve just received a commission for a 1.8m square Oak handmade table. I’m making a start as soon as the Oak – that I’ve sourced from one of my timber merchants – arrives and will keep you posted (with pictures) on it’s progress.